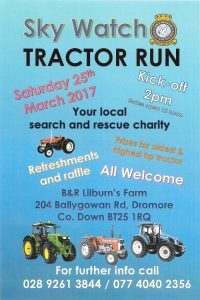 Sky Watch (NI) are holding a Tractor Run on Saturday 25th March 2017 to raise funds for training and equipment for their Search Unit. The gates open at 1200 and all are welcome to attend. The tractors will be setting of at 2pm and the run will last for approximately one hour returning to Lilburn’s Farm. Entry includes a £2 token to use at the catering van and one ticket for the raffle. Entrance forms are completed on arrival.